Posted on May 19, 2017 by Matthew Leib. This entry was posted in Faculty Friday, Spotlight and tagged Faculty Friday, UW Dance. Bookmark the permalink. 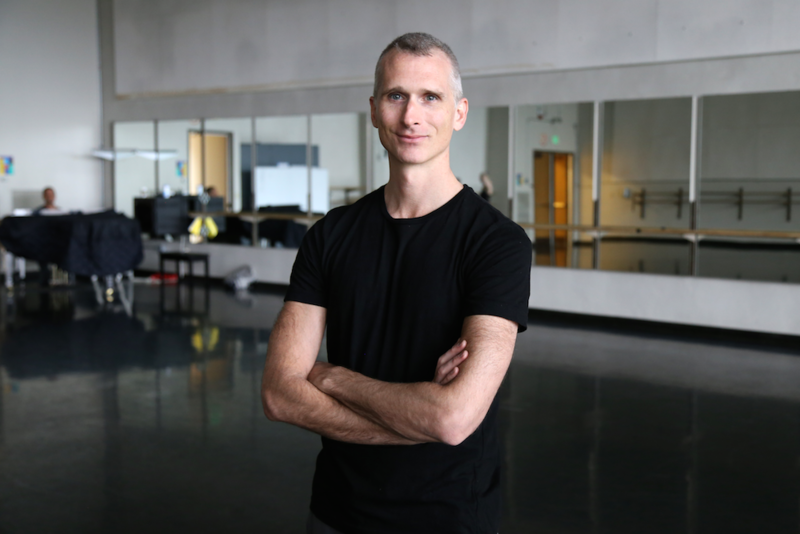 Today, McCormick is an assistant professor at the University of Washington’s Dance Program. Before joining the program—first in pursuit of his M.F.A., then as faculty, and now as graduate program coordinator—his career as a dancer transported him across continents: performing in Europe, the Americas, and touring as widely as Turkey, Indonesia, Malaysia, and India. But long before he was offered contracts with such eminent companies as Les Grands Ballets Canadiens and the Bavarian State Ballet, in order to dance, the 7-year-old McCormick needed to get the support of the company closest to home: his own parents. He says his mother received the idea well, reasoning that dance might be good for his coordination. His father, while “not crazy about the idea,” was also supportive. McCormick would soon have more fans—far beyond his hometown of Vineland, New Jersey. After attending Juilliard in New York on a scholarship, he moved to Montreal to join Les Grands Ballets Canadiens. There, he built on a European dance aesthetic first introduced to him by Juilliard’s director of dance, Benjamin Harkarvy, which McCormick describes as a “blending of forms between ballet and modern dance.” That international sensibility was supplemented, in turn, by Argentinian ballet master Hector “Maestro” Zaraspe, with whom McCormick also studied at Juilliard and for two summers in South America. After spending two years coming into his own as professional artist in Montreal, McCormick felt he was ready to take his exploration of dance as an international dialogue to the next level. “I was 24 and knew there were two things I wanted: to experience life in Europe and to dance for a large classical ballet company,” he says. In 2000, he signed a contract with the Bavarian State Ballet in Munich, where he would spend the next four years dancing in the company of more than 60 performers for a house of 2000 seats on one of the biggest stages in Europe, all while collaborating with his “heroes” from European dance: Mats Ek, Jiri Kylian, and many others. One of his favorite performances with the Bavarian State Ballet was dancing as Drosselmeyer in John Neumeier’s The Nutcracker—a role McCormick says was “probably one of the biggest” of his career. “It’s fun, eccentric, and there’s a lot of dancing in the role that really tells the story,” McCormick says of dancing the part of the mysterious, magician-like figure whose arrival sets the beloved ballet classic’s story into motion. There was also a twist in Neumeier’s staging’s characterization of Drosselmeyer that would foreshadow McCormick’s own future. “Instead of a Christmas story, it’s a birthday story and Drosselmeyer is the ballet teacher,” he says. His parents traveled from the US to watch several of the performances. After four years in Munich, McCormick was ready for a new challenge. He moved to Switzerland to work under Belgian choreographer Stijn Celis with the Bern Ballet, a smaller company which McCormick says Celis ran as something resembling to a dance “laboratory.” There, McCormick says he was challenged to examine preconceived notions of the nature of good dance, pushing boundaries physically, stylistically, and theatrically. When Celis left the Bern Ballet three years later, McCormick freelanced for a year before returning to Bern as a soloist and ballet master—the position charged with directing rehearsals, reinforcing choreography and technique, notating performances from the audience, and leading company dancers in class every morning. While McCormick was still stepping out on stage, he was also beginning to fill out his shoes as a dancer with an artistic vision all his own. The focused nature of the work eventually led McCormick to take a position as Assistant Artistic Director of North Netherlands Dance, a highly mobile company that would often tour multiple cities in a week from their base in the Dutch city of Groningen. But when Dutch government cuts to arts funding shuttered three of the country’s seven dance companies, McCormick’s visa expired and he returned state-side in search of his next step. He found it in Seattle and the UW’s Dance M.F.A. In 2013, with the 1,200-seat Meany Theater and broader cultural nexus of Seattle as backdrop, McCormick prepared to make his Pacific Northwest debut. Intended as a natural extension for careers in movement, the UW’s Dance M.F.A. prepares dance artists with a minimum of eight years professional performance experience for entry into an academic setting. For McCormick, the M.F.A. provided a welcome space for intensive study, professional reflection, and deep practice as part of a larger program that serves approximately 40 undergraduate dance majors, 80 minors, seven graduate students, and more than 900 non-major students who enroll in dance courses each quarter. “While I would not have had the career that I’ve had without going to Juilliard, I wish that I had had more of a rigorous education at that point in my life as far as studying,” he says. As an M.F.A. candidate, McCormick took courses across the University in Art History, English, Gender, Women and Sexuality Studies, and DX Arts, gaining firm footing in educational philosophy, anatomy for dance, and research methods he credits with reinforcing and extending what he’d learned as a performer to that point. “To have that opportunity in my late 30s was really a gift for me,” he says. Upon graduation, McCormick joined the program’s faculty, lending him the unique perspective of having seen the Dance Program’s graduate level from all sides as both student and professor. For his part, McCormick says he now identifies as a teacher as much as a dancer. It’s a form of collaboration that has always fueled his own creative undertakings, which he’s presented across Europe and the Americas: choreographing the opera Eugene Onegin for the Stadttheater Bern and restaging Stijn Celis’s choreography for The Merry Widow for the Royal Danish Opera, among other performances. In addition to his work at the UW, he also served as a guest rehearsal director with Ballet British Columbia for the 2015-2016 season. That trust in the process most recently resulted in two works that will be performed June 16 and 17 at the Seattle International Dance Festival: a solo revealing his international journey through the dance world and a group work titled, Boléro, created for the Dance Faculty Concert that explores the discord that can lie between individual and society, featuring UW Dance students. He’s also currently at work on an article about John Cranko, the seminal South African choreographer responsible for Germany’s ballet boom in the 1960s. If it seems like a lot of moving parts, it’s supposed to be that way. For McCormick, making connections with others through dance starts by staying in conversation with his own body. For all McCormick has achieved moving across the international stage, his favorite place to move couldn’t be farther from it. Whenever he returns to visit his hometown of Vineland near the Jersey Shore, he likes to go body surfing. For one who has danced at all corners of the globe, it is fitting, perhaps, that the earth provides the most natural lift. Bruce McCormick received his B.F.A. from the Juilliard School and M.F.A. in Dance from the University of Washington. Catch him and his work at the Seattle International Dance Festival, Friday, June 16 and Saturday, June 17.